Translate pixels into stitches in this fun, relaxing evening workshop. 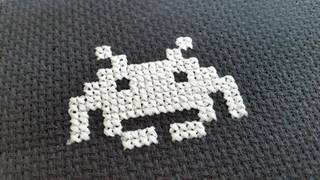 Kingpin of Contemporary Cross Stitch, Mr X Stitch, will teach you all you need to know to create your own video game inspired cross stitch in this informal evening workshop. Using Glow in the Dark thread, you will create your own retro video game icon to take away. This event is part of our Videogames: Neon Night, a series of pop up workshops inspired by the exhibition Videogames: Design/Play/Disrupt.